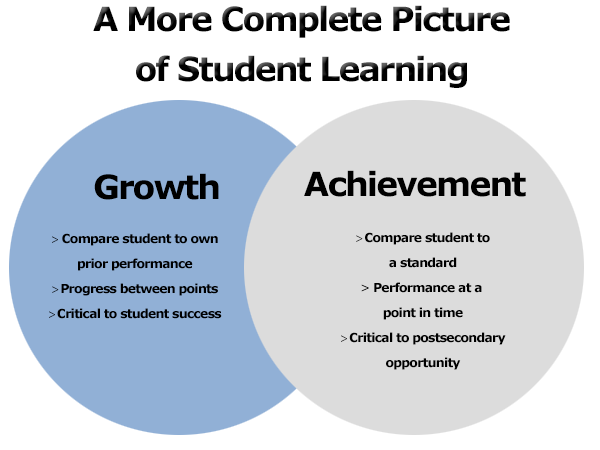 In order to get a better picture of school performance, both achievement level and growth need to be analyzed. 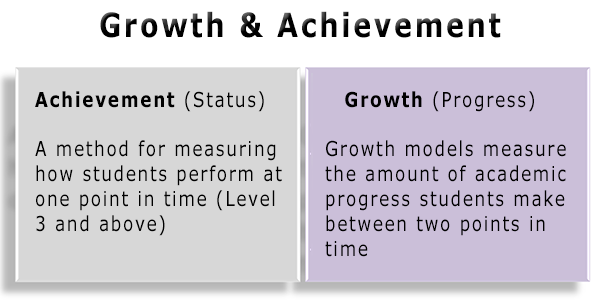 Achievement level measures how high or low students perform; growth measures whether students tend to make more or less than one year's growth each year. Understanding both is important. Plotting the achievement level and growth for a school gives a fuller picture of that school's performance. Every school would like to fall in Quad 1 (blue) - where students tend to have both high achievement level (above average performance) and high growth (making more than one year's gain each year). 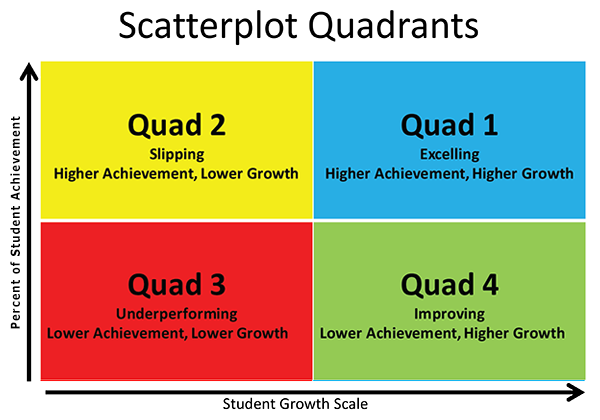 Quad 4 (green) is the next most desirable quadrant. Schools in this quadrant have achievement level lower than average, but have growth that is higher than average. Given time, these schools should improve and move into Quad 1. Quad 2 (yellow) are schools with higher than average achievement level, but students are generally making less than one year's growth in a year. The concern in this quadrant is that students in these schools may not be showing adequate yearly growth, and the school's achievement level may decline over time. Quad 3 (red) are schools where students have lower than average achievement level, and are generally making less than one year's growth in a year. This is the most undesirable quadrant. These are actual School Achievement Level vs. PYG Gain plots. The achievement level is based on FSA results and proposed achievement levels from the Florida Department of Education, and the gains are District PYGs (Proportion of a Year's Growth) measures. Hovering over any dot will show the school name and the associated data. These are sortable School Achievement Level/PYG Gain tables. The achievement level is based on FSA results and proposed achievement levels from the Florida Department of Education, and the gains are District PYGs (Proportion of a Year's Growth) measures. Each colored table can be toggle-sorted individually by clicking on the column heading. These animated graphs show the changes in school achievement level and growth over time. The simplest way to display these graphs is to click on the play button( ) To follow a specific school, click on that school and they use the play button. You can also reduce the tint on the other schools by clicking on the tool icon ( ) and decreasing the opacity of the non-selected items. Note: Motion graph rounding may result in some changes of > 2% (.02). Schools with greater than two (2) years or less than two years (-2) PYG do not appear on these quadrant scatter plots.